Joshua Grill, co-director of UCI MIND and associate professor of psychiatry & human behavior, is conducting a study of vitamin B3's effect on tau neurofibrillary tangles in Alzheimer's patients. The data on Alzheimer’s disease is sobering. It robs people of their memory as well as their independence and affects one in nine people over the age of 65, putting a difficult emotional and financial burden on families and the healthcare system. The number of Americans stricken with the disease will escalate rapidly — from 5.2 million now to a projected 13.8 million in 2050 — as baby boomers turn 65. The race is on for medical breakthroughs to prevent or cure Alzheimer’s, and a team of UC Irvine researchers and physicians with the Institute for Memory Impairments and Neurological Disorders, also called UCI MIND, are ramping up their efforts. As Orange County’s only state and federally designated Alzheimer’s Disease Research Center, UCI MIND is a powerhouse fueled by more than $10 million a year in federal research funding, supporting such work as the largest study of people over 90 and the use of stem cells to rescue memory in mice with advanced Alzheimer’s. 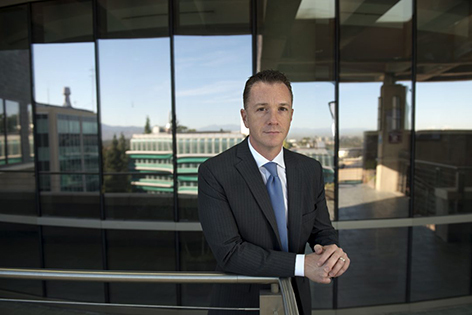 Under the leadership of Joshua Grill, co-director of UCI MIND and associate professor of psychiatry and human behavior, the institute’s portfolio of clinical trials to identify new preventions or cures is growing. "What’s so exciting at UCI MIND now is to see our track-record in basic discoveries related to Alzheimer’s disease and dementia be translated into ways that potentially could change clinical practice," says Frank LaFerla, dean of the Francisco J. Ayala School of Biological Sciences and co-director of UCI MIND. Two clinical trials are taking innovative nonpharmaceutical approaches to combating Alzheimer’s. One involves a common vitamin; the other, aerobic exercise. Grill received $2 million in July from the UC Cures for Alzheimer’s Disease Initiative to explore the effectiveness of high doses of vitamin B3 — known as nicotinamide — in reducing the accumulation of tau neurofibrillary tangles in Alzheimer’s patients. Tau is one of the two hallmark brain lesions — along with beta-amyloid plaques — common in the disease. The study will be conducted at UC Irvine, UCLA and UC San Diego, and Grill says patient enrollment will begin over the next several months. "One of the hurdles with Alzheimer’s disease has been a lack of potential therapies that target neurofibrillary tangles, as most have focused on amyloid plaques," he says. "Amyloid plaques may still be key to the disease, and perhaps we’ll need to target both plaques and tangles to stop the disease, but this study to see if nicotinamide can affect tau activity may be an important step in the pursuit of improved therapies. Nicotinamide is a safe product with some very interesting and supportive data in other disease categories." In the other trial, Carl Cotman — UC Irvine professor of neurology and founding director of UCI MIND — is co-leader of a nationwide study to gauge the effects of aerobic exercise on elderly adults with mild memory problems. The Exercise Evaluation Randomised Trial, or EXERT, will enroll 300 people at 12 sites, including UC Irvine. Each site will partner with its local YMCA, where for one year half of the participants will engage in stretching, balance and range-of-motion exercises, while the other half will focus on aerobic training. During the study, researchers will evaluate the impact of this physical exercise on cognition, brain atrophy and inflammation, and amyloid-tau biomarkers in blood and spinal fluid samples. The objective is to measure the positive effects of aerobic exercise on cognitive abilities and to generate data that can enable physicians to "prescribe" exercise to their senior patients in the proper "doses" to help stave off memory decline. Dr. Aimee Pierce, assistant clinical professor of neurology, is overseeing UC Irvine’s participation in both trials. People interested in participating in these or other UC Irvine clinical trials might consider joining the new UC Irvine Consent to Contact Registry. This free, confidential service allows adults, regardless of who their healthcare provider is, to learn about cutting-edge clinical research at UC Irvine and be matched to studies that fit their preferences and for which they might be eligible. The C2C Registry was developed by UCI MIND and the UC Irvine Institute for Clinical & Translational Science.